For those who don’t believe in an afterlife, the wisdom of the ages offers four great consolations for mortality: that death is benign and good; that mortal life provides its own kind of immortality; that true immortality would be awful; and that we experience the kinds of losses in life that we will eventually face in death. Can any of these consolations honestly reconcile us to our inevitable demise? 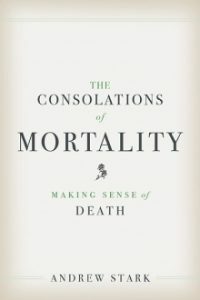 In this timely book, Andrew Stark tests the psychological truth of these consolations and searches our collective literary, philosophical, and cultural traditions for answers to the question of how we, in the twenty-first century, might accept our mortal condition. Ranging from Epicurus and Heidegger to bucket lists, the flaming out of rock stars, and the retiring of sports jerseys, Stark’s poignant and learned exploration shows how these consolations, taken together, reveal death as a blessing no matter how much we may love life.